The Carbon Credit pilot project offered by the Chicago Climate Exchange (CCX) has recently expanded its enrollment area into all of central and western Kansas. Previously, only the eastern half of Kansas was eligible for carbon credits for both conservation tillage and new grass plantings. Most of western Kansas was eligible only for new grass plantings. And southcentral Kansas counties were eligible for neither. The new enrollment criteria are included in the map below. A. 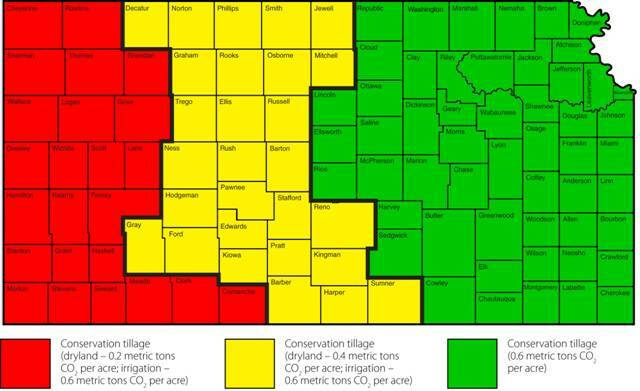 Eastern Kansas counties are now eligible for a carbon credit of 0.6 metric tons of CO2 per acre per year for conservation tillage for the years 2006-2010. * Eligible implements include: no-till drill, no-till and strip-till planters, rolling harrows, low disturbance liquid manure injectors, anhydrous ammonia applicator, manure knife applicator, sub-soil ripper with at least 24-inch shank spacing. * Ineligible implements include: field cultivators, tandem disk, offset disk, chisel plow, moldboard plow. * Fallowed acres are not eligible in this region. * No Exchange Soil Offsets will be issued in years in which residue removal occurs. * Residue burning is not allowed. B. In central Kansas, producers are eligible for a carbon credit of 0.4 metric tons of CO2 per acre per year for conservation tillage on dryland acres, and 0.6 metric tons of CO2 per acre per year for conservation tillage on irrigated acres for the years 2006-2010. * Irrigated acreage eligible for enrollment provided that the acreage began irrigation prior to March 26, 2007. Exchange Soil Offsets will be issued to eligible irrigated acres at a rate of 0.6 metric tons per acre per year. C. In western Kansas, producers are eligible for a carbon credit of 0.2 metric tons of CO2 per acre per year for conservation tillage on dryland acres, and 0.6 metric tons of CO2 per acre per year for conservation tillage on irrigated acres for the years 2006-2010. * Irrigated acreage is eligible for enrollment provided that the acreage began irrigation prior to March 26, 2007. Exchange Soil Offsets will be issued to eligible irrigated acres at a rate of 0.6 metric tons per acre per year. * CCX will no longer accept new contract enrollments that utilize ridge-till. Current contracts based on ridge-till practices will be honored through the current contract period which ends December 31, 2010. The credit rate for existing ridge-till contracts will remain at 0.5 tons CO2 per acre per year. Any current ridge-till enrollee who desires to terminate the Soil Offset Contract with the Iowa Farm Bureau at this time may do so without penalty or credit recovery. * CCX will no longer issue carbon credits on row crop land that has the crop residue removed (silage, straw baling, straw burning, corn stalk baling, etc.). This does not apply to alfalfa or grass hay, or grass pasturing. Land on which the residue is removed will receive zero "0" credit for the year in which the residue is removed. Residue removal does not nullify prior credits and will not trigger a credit recapture. It just results in a zero "0" credit rate on the affected land for that year. Any current contract enrollee who signed a contract with the understanding that residue could be removed and who desires to terminate the Soil Offset Contract with the Iowa Farm Bureau at this time may do so without penalty or credit recovery. * New credit rates for grass plantings are expected in the near future. There are many details and stipulations involved in this program, and producers should review the contract closely. Producers can sign a contract for the CCX program through either the Iowa Farm Bureau or National Farmers Union. For more information, contact Donn Teske, Kansas Farmers Union, 620-241-6630, or e-mail: dteske@bluevalley.net. Current prices on the CCX for carbon credits are currently averaging about $3.50 per metric ton of CO2 equivalent. The aggregators (Iowa Farm Bureau and National Farmers Union) determine when the credits are sold on the market, and take a small percentage of this for overhead. Carbon emission constraints are creating quite a stir in Washington. Convinced that the country must act, lawmakers on Capitol Hill are seeking direction from members of the European Union on how to establish an emissions trading scheme. Trading carbon emissions is a free market approach to controlling such greenhouse gases that are tied to climate change. European representatives along with participants in the trading program established there testified before a congressional panel that the system covers 45 percent of all carbon dioxide (CO2) emissions while giving industry a reasonably-priced solution to reducing their carbon levels. The establishment of an emissions trading plan could be critical to cutting CO2 levels. As governments around the globe continue to restrict the release of harmful pollutants, cap-and-trade systems involving carbon will take root. The thinking is that by trading credits, a "price" for emission levels is set that will send the proper investment signals to those who have to decide how to cut their emissions. Installing environmental controls, for example, may or may not be cheaper than buying carbon credits. In the case of the European Union, it began its emissions trading scheme in January 2005 with 27 participating nations. At present, the cap only covers CO2 but other greenhouse gases may eventually be included. The program runs in two phases: The first one started in 2005 and ends at the end of this year. The second phase runs from 2008 through 2012. Each country has submitted a "national allocation plan" that is now under review by the European Commission. Currently about half the trading volume occurs on exchanges and the other half over-the-counter, according to Resources for the Future. The market has grown from $8 billion in 2005 to $25 billion in 2006. The think tank expects that figure to hit $30 billion by year-end 2007. The current spot price of credits is cheap, about $1; current credits will expire at the end of phase one this year and cannot be renewed thereby diminishing their market value. The future value of those credits set for December 2008, however, is $20.25. Can U.S. companies afford this? "I do not think it would be politically acceptable to start with high credit prices," says Ray Kopp, a scholar with Resources for the Future. "Some areas of the country would take a big hit. The economy has to absorb this price rather slowly. We need to put in a program that is robust and that is able to sustain itself. Carbon will be priced and energy prices will rise." Europe's trading scheme is under attack in some corners. Some business groups are saying that government is still too heavy-handed and the added expenses will make compliance difficult while some environmental organization are saying that trading gives a government-sanctioned license to heavy polluters who simply choose to buy credits rather than implement new technologies. According to the conservative think tank, Competitive Enterprise Institute, all of the emissions allowances should have been auctioned off at competitive market rates and not freely handed out. It also says that the scheme is complicated and has imposed high administrative burdens that are costly to some manufacturing enterprises. More significantly, the Washington, D.C.-based organization says that European nations are falling short of their obligations, under the Kyoto Protocol, to cut carbon emissions. While that agreement calls on participating countries to reduce their CO2 levels by at least 5 percent from 1990 levels and by 2012, they are failing to do so, it says. The U.N says that figure is likely to be in the area of 3.5 percent. "Despite the caps on carbon dioxide emissions, nearly every Western European nation has higher carbon emissions today than when the treaty was signed in 1997, and these increases show no signs of leveling off," says Richard Morrison, of the institute. European leaders have acknowledged that the transport sector is the greatest challenge. But, they add that industry, generally, is up to the task. Once member nations get approval for their emission allowance plans and during the next phase of implementation, they will make critical decisions that include which companies and which industries are eligible for the credits. Under the rules, governments can provide, free of charge, 90 percent of credits while auctioning off 10 percent. Progress is ongoing. A liquid market for the trading of carbon emissions has been established while the infrastructure to facilitate such activity is functioning. Point Carbon, a market intelligence company, says that such advances along with an increasingly stable regulatory framework have promoted investor confidence. It is predicting a cut in greenhouse gases of the equivalent of 2 billion metric tons by 2012. So, the stage is now set for Europe to enter the second phase of its emissions trading scheme. Both policymakers and industry have climbed the learning curve while the private exchanges have responded by developing vehicles to create a liquid market and robust trading platform. The notion of carbon constraints and energy efficiency, meantime, are now firmly embedded in the European industrialization sector -- all critical to future success here in the United States. More details at: http://www.gw18.globalwarming.net/index.php .